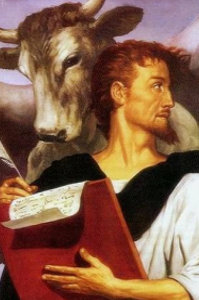 Good Saint Luke, we are told that before you met our dear Lord and became a follower of His and a writer of His Gospel, you were a doctor. We beg you this day to bless and help and protect our doctor. Obtain for him the graces he most needs to do his work well and serve God generously. Help him to be strong and gentle, prudent and charitable, understanding and self-sacrificing. Give him great skill in the care of our bodies, so that, blessed with physical strength and health, we may more faithfully perform our daily tasks. Help us all, good Saint Luke, to imitate very closely the life and virtues of our Blessed Mother Mary, about whom you wrote so beautifully, and of Him whom she bore into this world, Jesus Christ our Lord and our God, who lives and is King for ever and ever. Amen. Almighty God, who didst inspire thy servant Luke the physician to set forth in the Gospel the love and healing power of thy Son: Graciously continue in thy Church the like love and power to heal, to the praise and glory of thy Name; through the same thy Son Jesus Christ our Lord, who liveth and reigneth with thee, in the unity of the Holy Spirit, one God, now and for ever.